Another book that I never would have even seen if I was still concentrating on weekly floppies. 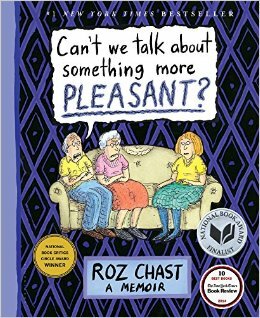 This is a memoir by a cartoonist named Roz Chast. It is about her dealing with the last years of her parents lives, and all that entailed. This… this… yeah. It is strong, powerful stuff. Some of it hit very close to home and some of it just made me feel very, very guilty. Some of this reminded me of my Dad while also reminding me that I wasn’t the one there, dealing with the worst of it. Her complicated relationship with her mother, though… yeah. That rang true for me and my dad. Still… a very moving book.